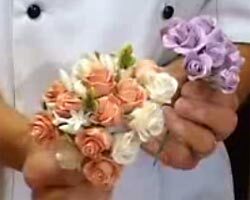 Learn how to make Sugar Flowers. Learn the fine art of cake decorating for weddings. This video tutorial will show you how to make sugar flowers to decorate you own wedding cake. Step by step cake decorating instructions on how to make expert wedding cake decorations. Also included in the instructions are the cake decorating tools necessary to complete this project ensuring your venture is successful right down to the very end. If you plan to make your own wedding cake, there are more video tutorials further down at the end of the page that shows you how to make your own cake and how to frost your wedding cake with either buttercream frosting or fondant icing. Mean while lets get back to making sugar paste flowers and wedding cake decorations. • A good quality paint brush. • A single rose petal cutter. • A five rose petal rose cutter. • A dog bone tool. • Green stemtechs or florist tape. Dog bone cake decorating tool softens edges of petals and leaves. Making Sugar Flowers, Petal Paste Technique. Kim Patino of "Coffee and Cakes in Frodsham" demonstrates how to make sugars flowers for decorating cakes. These lovely wedding cake decorating ideas are so impressive and not difficult to make. 1. To make your first rose, you need to make a bud on a wire. You need to buy some florist paste, you can get this from any good standard sugar craft shop. To do this; take a piece of cake wire or florist wire. Cut it about 10 cm long and make a small bent hook in one end. This little hook shape will secure the bud. 2. Next; take approximately a pea size portion of icing paste and mould it into a ball - feed the wire through the ball of paste from the sharp end of your wire up to the hook. This creates the first stage of your bud. You need to make a few of these (make as many of them as you need to create your bouquet of flowers). You have two sets of rose cutters; a single rose petal cutter and a five petal rose cutter. For each one of these buds, initially you will need two of the five rose petals cut-outs and two single petal cut-outs. 3. To make the second stage of your flower bud. Cut out two single rose petals with your single rose petal cutter first. Your going to need a paint brush and some clear alcohol, (because clear alcohol evaporates, but water can leave a stain). Apply a very small dab of alcohol on each petal, you don't need a lot. 4. Take one of the first stage buds and press the head down onto one single moist petal so that it sticks, fold one side of the petal in, then fold the other side over it, so it overlaps. Where the fold joins, point it downwards and press the bud on the another single moist petal so it sticks and picks it up - do the same folding method with this petal too; fold one side in, then the other side over it, so it's overlapping. There's your flower bud!. 5. The next stage is to add more petals to your bud. Cut out two five petal roses using the five petal rose cutter. Press the cutter down onto the rolled-out icing paste with even pressure. Push evenly on all five petals. Jiggle the cutter a little to ensure all five petals are pressed and cut through the icing. Make sure it cleanly cuts all the way around, so that you have a perfect 5 petal rose. 6. Place the 5 petal rose cut out in one hand and with the other hand, get the dog bone tool and press down on each of the 5 petals and edges in a circular motion to create a natural looking rose petal. The wider end of the dog bone gives a better more natural rose petal finish. When you finish doing this, apply a small dab of alcohol with your brush in the middle and up each petal (you don't need much, you don't want it to go soggy). 7. Take your bud and pierce the sharp end in the middle of the moist five petal rose. Slide it through your fingers, because it needs to come out the bottom and straight through the middle. Then take two petals at once, fold one petal down; you over lap and underlap so that wraps around. Then with the other three petals, press all three all the way around and overlap them (just like a natural rose). 8. Take another moist five petal rose through the middle of the one you just did (to give you rose more petals). Press the sharp end through your fingers. Fold these five petals around evenly. If you turn it upside down you can overlap each petal easily on to the next petal, adjust them a little and then leave that to dry. 9. Next; the green calics. to make them, you need some standard white petal paste. You need to colour it green. Get you calic cutter and cut through the green icing paste. Apply some alcohol on it, then pierce the bud through the sharp end and though the middle of the calic between your finger and your thumb, thread it up the wire, turn it upside down and just a little bit of pressure attaches it. 10. Green florist tape. You can buy this from any good craft shop or florist. Put as many of these finished sugar flowers together as you want to form a bouquet, then tape it together with the tape. 11. Steaming the sugar flowers. This is final step. Steaming evaporates and gets rid of all the extra icing sugar powder and gives your sugar bouquet a nice finish and sheen. You can use a kettle or a small bowl of hot water. Just hold your mini bouquet upside down over the steam for only 30 seconds. The steam just takes all the icing sugar off and leave a nice finish. 12. Leave them to dry. They are then ready to use the next day. This gives you a nice little bouquet of flowers to place on your wedding cake. Cake decorating for weddings can seem difficult if you've never done it before. You may surprise youself as to how easy it really is. Making wedding cake decorations from scratch is really a lot of fun. You can do this with your bridesmaids or close family and friends.